It's our final set of Alfred Angelo's Disney wedding jewelry! We will close with the final two Disney princesses: Tiana from Princess and the Frog and Rapunzel! I don't know why there's only two rows instead of three for Tiana...but either way I love these! 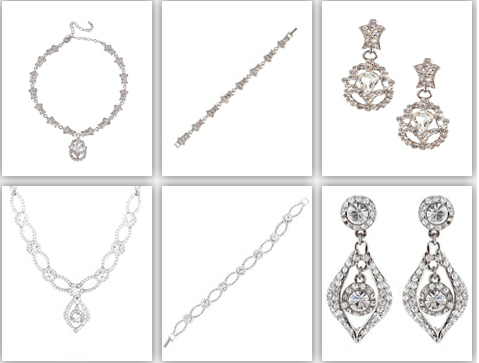 I really like the necklace in the bottom row with the bracelet and earrings. The top earrings are really cute too. This concludes the Fairy Tale Wedding jewelry series! Which also concludes all of the sets that are included in the Alfred Angelo Disney Fairy Tale Wedding collection. I hope you enjoyed them! The next series I will be showing is the Disney prom dresses by Alfred Angelo. Unfortunately they don't categorize the dresses into princesses like the wedding collection, but I will find a way to break them up so I don't put all of the dresses up at once (that'd be a little overwhelming). I hope you all have had a great weekend! I'm currently watching Ratatouille on ABC Family. I feel like this movie flies under the radar too much.